Īnanga usually live for one year. In autumn, adult females release their eggs among vegetation around the high-water mark on a very high (spring) tide. Males release milt (sperm) to fertilise the eggs. When the tide recedes, the eggs are exposed to the air for a number of weeks but remain moist among the vegetation. When another spring tide reaches the eggs, larvae hatch. The falling tide then carries them out to sea. The hatchlings spend the winter at sea, feeding on small crustaceans. In the springtime, juvenile īnanga make their way upriver. This is the whitebait stage. Those that reach fresh water remain there as adults for spring and summer. 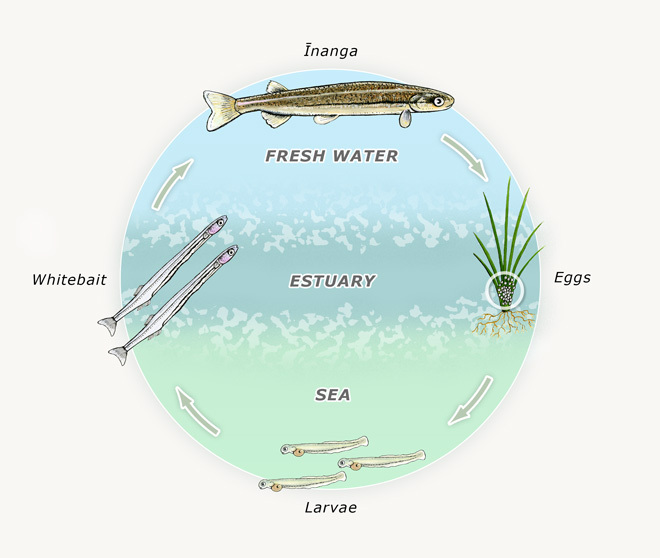 In autumn, the adult fish make their way downstream to spawn in estuaries.